The Lucky Club online casino can take you on an unforgettable journey with dozens of casino games and lucrative promotions. Start with the $22 bonus code promotion and work your way up to the amazing $2,222 welcome bonus! 100% Deposit Bonus PLUS 77 Free Spins! Now, until May 15, get a 100% matching bonus at Lucky Club Casino! You’ll also enjoy 77 FREE SPINS on Lucha Muchacha – the spicy, Mexican-themed slot game. Not that long ago, if you wanted to have some fun while gambling, you had to travel to a land-based casino and blow your entire weekend to enjoy this exciting activity. Nowadays, you don’t even have to leave the house to gamble as much as you’d like. You can find dozens of casinos online, the only problem being that there are almost too many casinos to choose from. This Lucky Club Casino review is here to provide you with relevant information regarding this gambling venue, and who knows – maybe it will help you make up your mind about where you would want to gamble. The first time you visit the casino’s website, you can immediately see that it is user-friendly and that you won’t have any problems with finding whatever you’re looking for to enjoy your gambling session. You can access all the casino has to offer via the instant-play casino or the software that you can download. Once you decide how you want to access the games and promos, you can deposit cash to your account via any popular payment method, including your credit cards, Eco, Neteller, Paysafe Card and more. Use their generous welcome bonus code to get more punch for your dollar. The moment you register at the casino, you will be able to access dozens of casino games. 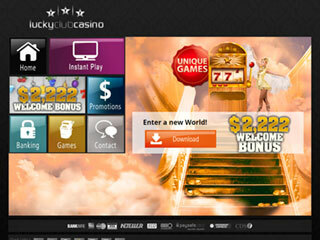 Apparently, Lucky Club specializes in online slot games – which are considered as simple yet lucrative games. So if you want to have an uncomplicated gambling session, those games will suit you best. However, if you are more interested in playing table games or card games, you might find the casino’s selection of games a bit lacking, which is something you should take into consideration when you contemplate on joining a gambling venue. The moment you join the casino, you will be able to use the Lucky Club bonus code promos to boost your wins without exerting yourself too much. First of all, you have the welcoming package, which consists of three matching bonuses and one no-deposit cash prize that sum up to $2,222 in total. You also have various daily and weekly bonus code promos you could use to increase your chances of winning, such as the 25% cashback bonus, the weekly $777 prize, and the free spins you could get every day if you deposit a specific amount of cash. All those bonuses can help you reach your maximum potential when you gamble, so you should definitely keep track of the changing promos and make the most out of every single one of them. The casino is powered by NuWorks software, which is not as popular as it could be, but TST – a gaming fairness firm – audits it on a regular basis, and you can rest assured that this is a trustworthy gambling venue. In terms of security, the Lucky Club Casino uses the most advanced tech to protect your personal information while you gamble, thus allowing you to deposit cash and place bets without worrying about the safety of your money. If you have any issues while you gamble, you can contact the casino’s support team around the clock, by using the live chat, Skype, email, or the phone support line. 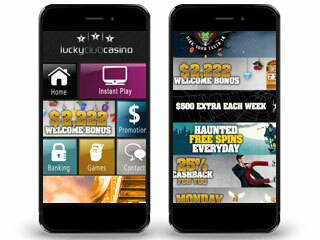 Lucky Club is a gambling venue which uses an uncommon software, which sets it apart from other gambling venues. It can grant you access to a wide selection of slot games and lucrative promotions, so if this fills the bill of what you’re looking for in an online casino – you should give this casino a try – you won’t be sorry!